Cross-section of two motile cilia, showing the "9+2" structure. A cilium (plural, cilia) is a thin, short, hairlike extension or appendage of a eukaryotic cell that projects approximately five to ten micrometers (μm) outward from the cell body. There are two types of cilia: motile cilia, which constantly beat in one direction and result in movement of the cell or of fluids (water, mucus, etc.) around the cell, and non-motile cilia, which typically serve as sensory organelles. Reflecting the connectedness of life, cilia are found in protozoans, invertebrates, vertebrates, humans, and even some plants. However, cilia are characteristically shorter and occur in larger numbers than flagella. Flagella typically occur singly or in pairs; on the other hand, the unicellular paramecium has 17,000 cilia on its surface (Towle 1989). There are also functional differences in terms of type of movement or force exerted. Flagella use a whip-like action to create movement of the whole cell, such as the movement of sperm in the reproductive tract. 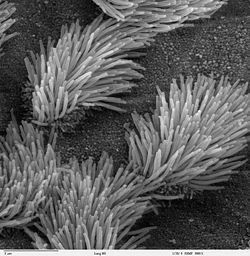 Cilia primarily use a waving action to move substances across the cell, such as the ciliary esculator found in the respiratory tract. Cilia may also function as sensory organs. The structural similarity of cilia and eukaryote flagella is such that some authorities group cilia and eukaryote flagella together and consider a cilium simply a special type of flagellum—one organized such that many cilia may work in synchrony (Patterson 2000). The term undulipodium is used for an intracellular projection of a eukaryote cell with a microtuble array and includes both flagella and cilia. Cilia are found in protozoan, plant, and animal cells, but are rare in plants, occurring most notably in cycads. In protozoa— a diverse group of single-celled, microscopic or near-microscopic protist eukaryotes that commonly show characteristics usually associated with animals—those organisms with cilia (ciliates) are generally placed in the phylum Ciliophora, while those with flagella (flagellates) are generally placed in the phylum Zoomastigina (or Mastigophora). There are about 8,000 known species of ciliates in phylum Ciliophora, living in both marine and freshwater habitats (Towle 1989). 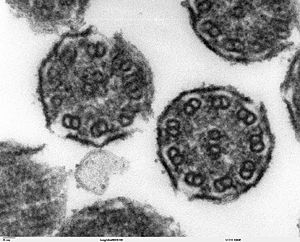 Protozoan ciliates possess motile cilia exclusively and use them for either locomotion or to simply move liquid over their surface. Some ciliates bear groups of cilia that are fused together into large mobile projections called cirri (singular, cirrus). Among the better known protozoan ciliates is the freshwater genus Paramecium. A paramecium has a rigid protein covering, the pellicle, that is covered by thousands of cilia arranged in rows (Towle 1989). The cilia beat in waves, moving slantwise across the long axis of the body, causing the paramecium to rotate as it moves forward (Towle 1989). On a paramecium, there also is a funnellike oral groove lined with cilia that create a water current that sweeps bacteria, protists, and other food down the groove to the mouth pore. SEM micrograph of the cilia projecting from respiratory epithelium in the lungs. Among animals, nematodes and arthropods only have non-motile cilia on some sensory nerve cells. Larger eukaryotes, such as mammals, have motile cilia as well as non-motile. Motile cilia are rarely found alone. They are usually present on a cell's surface in large numbers and beat in coordinated waves. In humans, for example, motile cilia are found in the lining of the trachea (windpipe), where they sweep mucus, which traps bacteria and dirt, out of the lungs. In human females (and in all female mammals), the beating of cilia in the Fallopian tubes moves the ovum from the ovary to the uterus. In contrast to motile cilia, non-motile cilia usually occur one per cell. The outer segment of the rod photoreceptor cell in the human eye is connected to its cell body with a specialized non-motile cilium. The dendritic knob of the olfactory neuron, where the odorant receptors are located, also carry non-motile cilia (about ten cilia per dendritic knob). Aside from these specialized examples, almost all mammalian cells have a single, non-motile "primary cilium." This has a 9 + 0 axomere (microtubule-based cytoskeleton) with a ring of nine outer microtubule doublets, as opposed to the 9 + 2 arrangement of motile cilia, which also have two central microtubule singlets (Gardiner 2005). Though the primary cilium has historically been ignored by scientists, recent findings regarding its physiological roles in chemical sensation, signal transduction, and control of cell growth, have led scientists to re-evaluate its importance. To grow a cilium, the building blocks of the cilia, such as tubulins and other partially assembled axonemal proteins, are added to the ciliary tips, which point away from the cell body. A bi-directional motility called intraciliary/intraflagellar transport or IFT plays an essential role to move these building materials from the cell body to the assembly site. IFT also carries the disassembled material to be recycled from the ciliary tip back to the cell body. By regulating the equilibrium between these two IFT processes, the length of cilia can be maintained dynamically. Ciliary defects can lead to several human diseases. Genetic mutations compromising the proper functioning of cilia can cause chronic disorders such as primary ciliary dyskinesia (PCD). In addition, a defect of the primary cilium in the renal tube cells can lead to polycystic kidney disease (PKD). In another genetic disorder, called Bardet-Biedl syndrome (BBS), the mutant gene products are the components in the basal body and cilia. BBS is a rare disease that causes multiple organ defects and is traced to malfunctioning cilia (Gardiner 2005). Lack of functional cilia in mammalian Fallopian tubes can cause ectopic pregnancy (development of a fertilized egg outside of the uterus). A fertilized ovum may not reach the uterus if the cilia are unable to move it there. In such a case, the ovum will implant in the Fallopian tubes, causing a tubal pregnancy, the most common form of ectopic pregnancy. Cavalier-Smith, T. 1987. The origin of eukaryote and archaebacterial cells. Annals of the New York Academy of Sciences, 503: 17-54. Cavalier-Smith, T. 2002. The phagotrophic origin of eukaryotes and phylogenetic classification of Protozoa. International Journal of Systematic and Evolutionary Microbiology, 52: 297-354. Gardiner, M. B. 2005. The importance of being cilia HHMI Bulletin. September, 2005. pp. 32-36, 64. Retrieved November 6, 2007. Towle, A. 1989. Modern Biology. Austin: Holt, Rinehart and Winston. ISBN 0030139198. This page was last modified on 22 May 2013, at 15:11.